Southwest Harbor, Maine's Peter Homer performs tests with his homemade spacesuit glove during NASA's 2007 Astronaut Glove Challenge on May 3, 2007. Homer's entry won top prize, $200,000, during the contest. If it fits like a glove, it may just win the prize. NASA offered a total of $400,000 to inventors who canmake stronger and more dexterous spacesuit gloves Thursday in the second AstronautGlove Challenge. The competition, part of NASA's Centennial ChallengesCompetition to spur private spaceflight engineering, was held at theAstronaut Hall of Fame in Titusville, Fla., close to NASA's Kennedy SpaceCenter. Two teams are competing, including aprevious winner. "[Gloves are] probably the most difficult part of thespacesuit to make," said Andy Petro, Centennial Challenges programmanager. "The original intent of the challenge was to see if opening thisup to a wide-open field of innovators, they might come up with some new ideasthat would be an improvement over what exists now." If any competitor's glove can beat NASA's current design,the agency will award part of the prize pot. Astronaut gloves are tricky toengineer because they must be strong enough to protect hands from theharshness of space, and also flexible enough to allow complex movements withouttiring out hands. The top prize purse is $250,000, with $100,000 to be givento the runner up. Contestants' gloves will be subjected to a box that simulatesthe vacuum of space, and will also be filled with water until they burst tomeasure their strength. "[Contestants] bring several copies of the glove, andone of them gets destroyed in the testing," Petro said. And this year, gloves must include not only an inner pressurizinglayer, but an outer thermal protection layer to shield against extremetemperatures and micrometeoroids, or small space junk. This is the latest of numerous Centennial Challenges eventsthis year, including a space elevator contest and a lunar lander competition inwhich NASA awarded $3.3 million in prizes. In October competitors vied to userobots to digfake moon dirt; the winners received a total $750,000 in prize money. "We have six ongoing multiyear competitions and severalended this year with all the prize money being won," Petro told SPACE.com. "We hope to announce at least one new one this year, and if we get additionalfunding we'd like to announce several new ones." 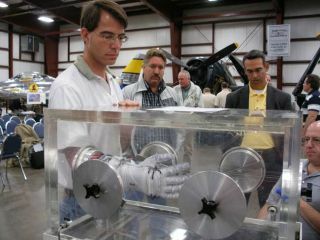 The first-ever Astronaut Glove Challenge was held atConnecticut's New England Air Museum in May 2007.? That year, Peter Homer,an engineer from Southwest Harbor, Maine, took home the top prize. Homer isback this year with a new-and-improved design aiming to snag a win again. He iscompeting against Ted Southern, of Brooklyn, New York, who also participated inthe 2007 challenge.